The public are invited to attend Friday’s (22 June) national commemoration to mark the 68th anniversary of the start of the Korean War being held in the Hall of Memories at Pukeahu National War Memorial Park. Pukeahu, where New Zealanders reflect on this country’s sacrifice in times of war as well as its contribution to peace keeping, will host the commemoration attended by Minister of Defence Hon Ron Marks, Republic of Korea Ambassador His Excellency Mr Seung-bae Yeo and Korean War veterans. The commemoration includes a wreath laying, the Last Post and the Ode of Remembrance. Both the New Zealand and the Korean National Anthems will be played. The Korean War began on 25 June 1950, when communist North Korean forces crossed the 38th Parallel into South Korea. New Zealand was one of the first countries to answer the United Nations Security Council’s call for combat assistance. Some 6000 New Zealanders served in Korea between 1950 and 1957; 4700 were members of the army’s Kayforce and 1300 served on the six Royal New Zealand Navy frigates which were active around the Korean peninsula. Forty-five New Zealand servicemen, including two naval personnel, died in Korea and two others died serving with Australian forces. 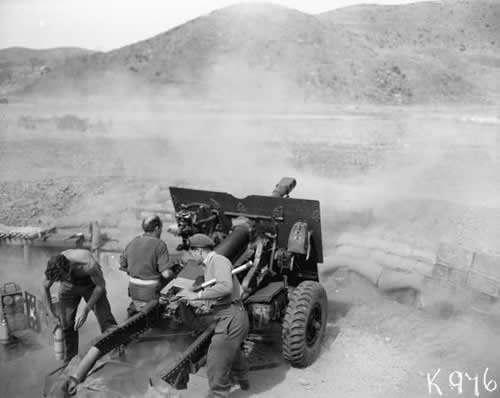 New Zealand gun crew in action in Korea, 1 April 1952. Image sourced from NZ History. Tomorrow’s commemoration concludes with the laying of tributes on the Tomb of the Unknown Warrior. People wishing to attend should be at the Hall of Memories, Buckle Street, at 10.45am for an 11.00am start.